Moore was instrumental in building the Belt Line Railway, Toronto’s firstcommuter train. He personally oversaw the construction of the Belt Line’sshowpiece station at Moore Park. Moore leveraged all his money on the Belt Line, predicting it would bring manybuyers to his Moore Park subdivision. However, shortly after the Belt Line openedToronto suffered through a horrible Depression and the Belt Line went bankrupt. This setback postponed the building of homes in Moore Park until the early 1900’s. By the 1930’s, Moore Park was completely developed. Moore Park is surrounded on all sides by natural barriers. To the north is the Mount Pleasant Cemetery, to the south is the Park Drive Ravine and the railway tracks, to the east is the Moore Park Ravine and to the west is the Vale of Avoca Ravine. With so much nature at its doorstep, it is not surprising that Moore Park is one of Toronto’s most sought after neighbourhoods. Loring-Wyle Parkette is a small plot of land, on the northeast corner of the Mount Pleasant Road and St. Clair Avenue East intersection in Toronto’s Moore Park neighbourhood, dedicated to the art and memory of two famous Toronto sculptors: Frances Loring (1887–1968) and Florence Wyle (1881–1968). Until October 1976 the long, narrow property served as the Moore Park turnaround loop for the TTC’s Mount Pleasant streetcar. The parkette, established in 1984 at the request of the Moore Park Residents’ Association is located one block north of the converted church schoolhouse at 110 Glenrose Avenue that served as the artists’ studio. The parkette contains busts of both women, each carved by the other. In addition, there are 2 sculptures done by Wyle: Young Girl (1938) andHarvester (1940). 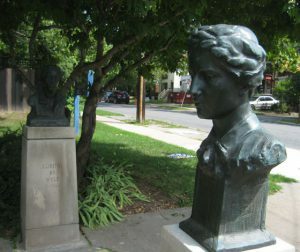 Other than the bust of Wyle, there are no other works by Loring displayed in the parkette, as she preferred to work on the monumental scale, and the small area allotted is not suitable for works of that size.